Welcome to Day 3 of the Waltzingmouse Sneak Peeks! All 5 of the new stamp sets will be available to purchase on May 1! 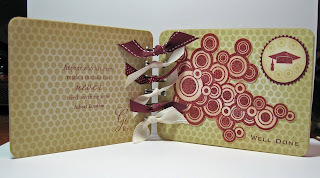 Today I think you will be very excited to see doily stamps!!! Claire has made two sets for this release - Dainty Doilies Large and Dainty Doilies - 2 - Small. I used a fun technique in stamping this card - it's called Ghosting. I found instructions here on Sharon Harnist's blog. Basically, I stamped a doily from the Dainty Doilies Large set on white card stock with white pigment ink (I used Brilliance Moonlight White). You have to let this dry or use a hot gun to speed up the process. 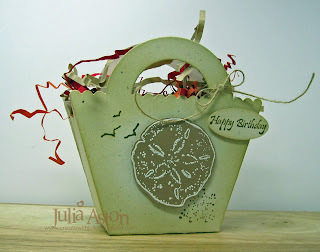 Then I sponged over the pigment stamping with dye inks - I used Ranger Distress inks. Doesn't this look great??! Try it with all different colors! I punched the lacey edge and added the tassel with a coordinating brad. 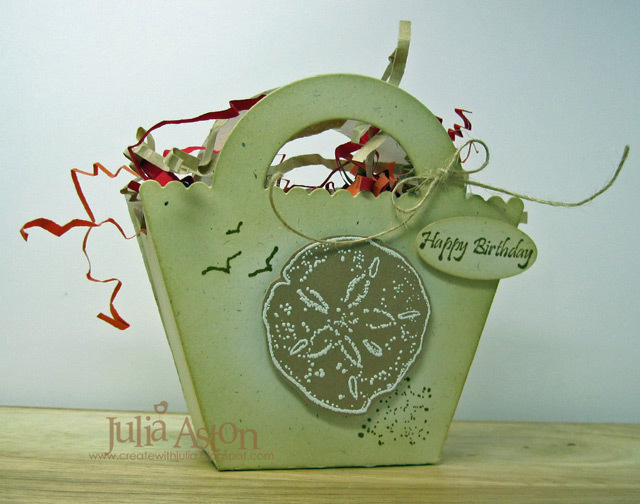 Then I stamped a doily from the Dainty Doilies - 2 - Small set in a darker green. I added a gem to the center. The sentiment is from the new set we previewed yesterday - Join Us. I used a Trio Label from Spellbinders to die cut it and popped it up on foam tape. Here's what I stamped on the inside - the sentiment is from Join Us and the doily is from Dainty Doilies Small - that I cut out with a large Scallop Circle Nestability that I sponged before taking it out of the die. I used today's Waltzingmouse Sketch for my card - here's the fun sketch Claire designed for us this week. Check out the WMS Sketch Blog and get inspired by the cards the Mischief Makers and other DT members have created using this week's sketch. You'll also find all the details about the weekly sketch challenge and how you could win a free stamp set by linking up your sketch card there! Here are links to the rest of the Design Team so you can see what fun things they created using the new doilie sets! Ink: Brilliance - Moonlight White, Ranger Distress - Scattered Straw, Bundled Sage, Peeled Paint. Accessories: Framed Brad - Deja Views Mango, Rhinestone Stickers - Darice/Michaels, tassel - Ellison, lace punch - Martha Stewart, large Scallop Circle Nestability, Trio Labels - Spellbinders, foam tape. Wow - did you enjoy all the creative ideas the Waltzingmouse DT had for the new Gingham set? Thanks for all of your wonderful comments left here yesterday. 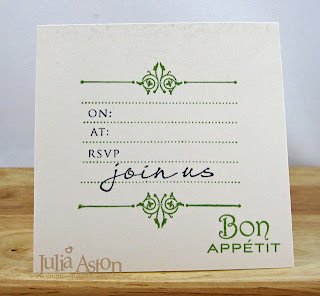 Today we have a really fun set to show you - it's called Join Us and includes all kinds of sentiments and images that can be used for invitations or thank you notes. 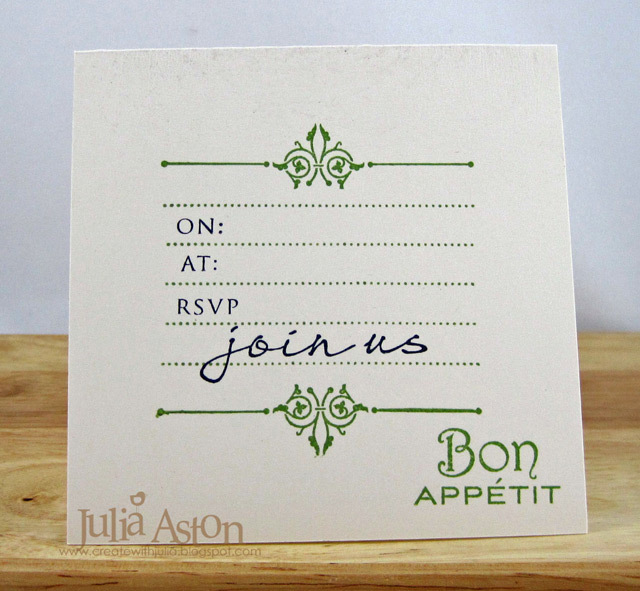 Today I made a pretty little invite to a dinner celebration. I love how some of the sentiments are in cursive and others are type - it sort of looks like I wrote parts of it myself! Inside I used the same lines stamp and Bon Apetit from the Victorian Frippery set - and more of the Join Us word stamps. So there you have it- a pretty, easy to make, impressive little invite! Here are links to the rest of the Design Team - I can't wait to see what they've made with this fun new set - let's go look shall we?! Ink: Memento Tuxedo Black & Bamboo Leaves, Ranger Distress Shabby Shutters. Accessories: Square Nestabilities, rhinestone stickers - Michaels, Yellow Stickles - Ranger, blending tool & nonstick craft mat - Ranger. Welcome to Day 1 of the Waltzingmouse Sneak Peeks! Claire is releasing 5 fun new sets on May 1 and today the Design Team is highlighting Gingham + Co - a super new background set! I used 3 of the 4 stamps included in this set on my card today - I used the negative dot stamp on my die cut grass (stamping a white panel with green ink), the medium gingham stamp on my die cut flower (stamped with orange on white and sponged with yellow) and the small gingham stamp on my scallop cut piece at the top! 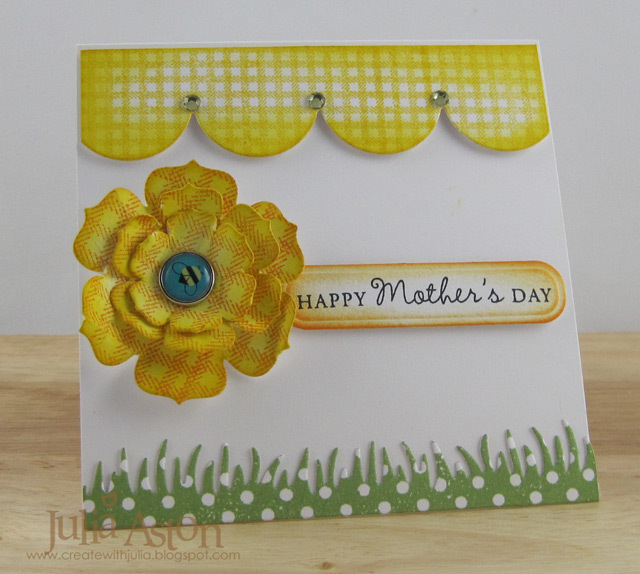 (stamped on white with yellow and sponged with yellow) Just click on the pic to see more detail. Here is the list of all the Design Team members posting a Sneak Peek of this set today - Please check them out to see what inspiration they have for us! 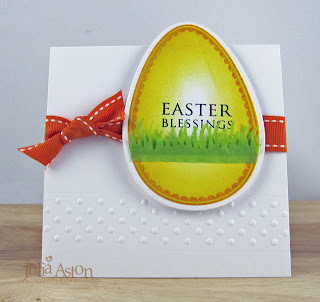 Stamps: Waltzingmouse - Gingham + Co. (new release May 1), sentiment from Spring Baskets. Accessories: glazed brad - Basic Grey Urban Prairie, fresh cut grass die - MFT, scallop edge die & flower die - PTI, Trio Labels - Spellbinders. You Light Up My Life! 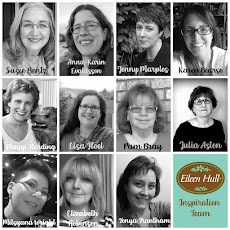 A Sweet N Sassy "Sweet Peak"
I can finally share some fun news with you all - a few months ago Korin Sutherland, owner/designer of Sweet N Sassy stamps invited me to join her DT for 3 months starting in May! I just love her sweet images as well as the many Faith based sets she has. So here is my first project - a "sweet peak" of a set being released on May 1 - called Shining Light. I've used two of the stamps in this set for my card today - the lovely light house and one of the many sentiments. I used the colors from today's color challenge over on Split Coast which I just happened to be hosting this week!! The colors are Certainly Celery, Baja Breeze and Bashful Blue. Just click on the image to see it larger. My sketch is from the Get Sketchy Challenge. 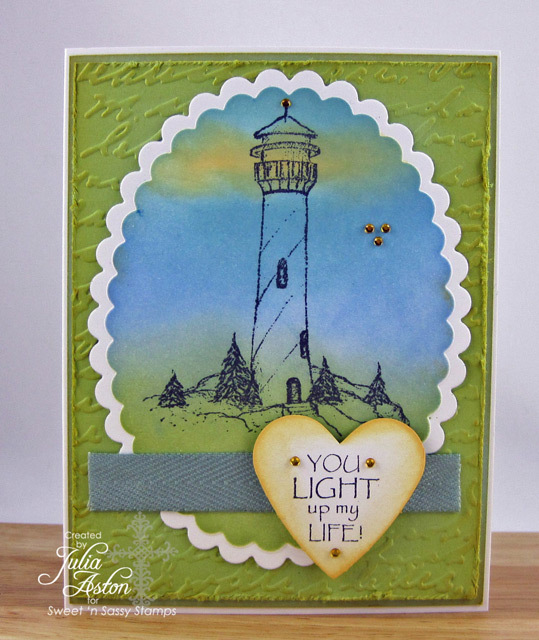 First I stamped the lighthouse image than cut it out with a Petite Oval Nestability. I sponged the 3 challenge colors over the image adding a little Scattered Straw around the light. Then I removed the panel from the die. I embossed the green panel with text, sponged and distressed the edges, layered that to a blue sponged panel and then adhered it all to the white card. I punched the heart from a white scrap, stamped the sentiment on it, sponged the edges and added a few gems. I adhered it over the twill with foam tape. This would make a great 'guy' card don't you think? You'll find more info and pics of this lovely new set over at the Sweet N Sassy blog. It will be available for purchase on May 1! Ink: Certainly Celery, Baja Breeze, Bashful Blue - SU, Scattered Straw - Ranger Distress, Memento Tuxedo Black. 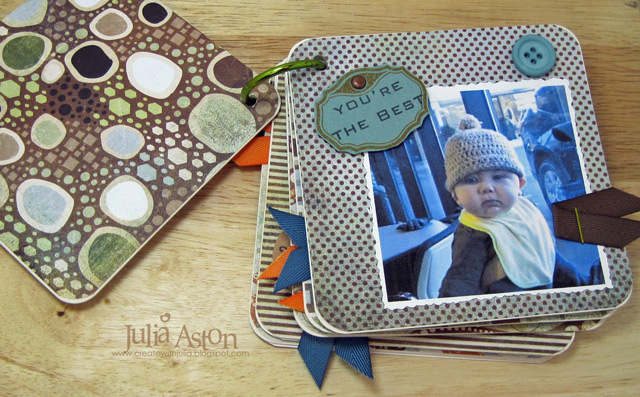 Accessories: Petite Scallop Ovals - Nestabilities, Heart Punch -EK Success, Script Embossing folder - Cuttlebug/Provo Craft, tiny gems - Taylored Expressions, twill - Martha Stewart. It's Saturday which means it's time to check out this weeks Waltzingmouse Sketch for inspiration! 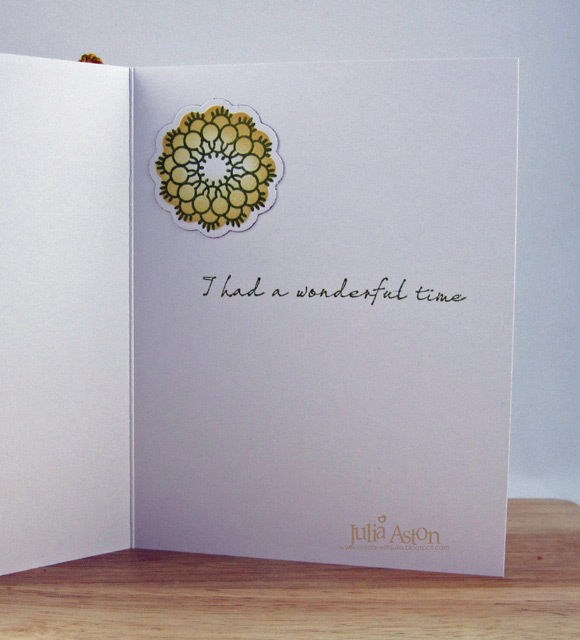 It's a pretty simple one with a little bit of embossing on it! Pretty fun isn't it?! 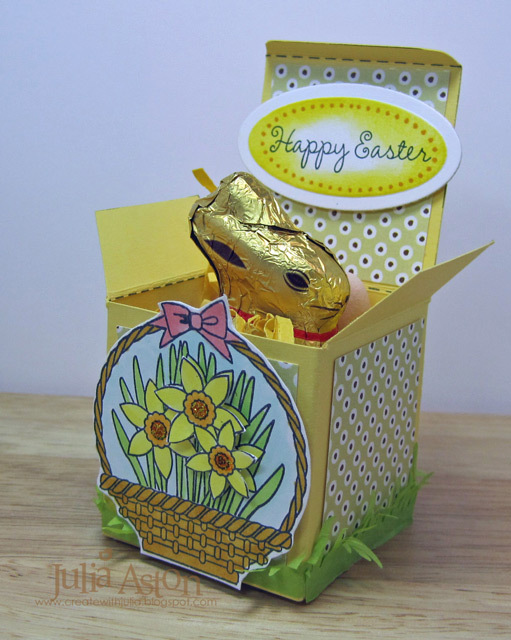 I decided to go for one more Easter card - Just in time huh?! My stamps are from the WMS Nestie Eggs set which happily fit in the Nested Eggs Nestabilities. I stamped my egg, cut it with the die and sponged the egg before taking it out of the die. I added a little strip of grass below the sentiment and popped it over the ribbon with foam tape. Just click on the pic to see it larger. 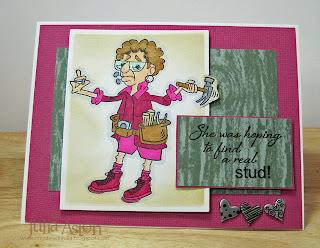 Then make your own card using at least one Waltzingmouse stamp and the sketch and link it on the Sketch Blog by Thursday 4/28/11 at 11:59 pm EST - you could be chosen Top Mouse !! This also fits the Crazy4Challenges challenge today - to make an Easter card! 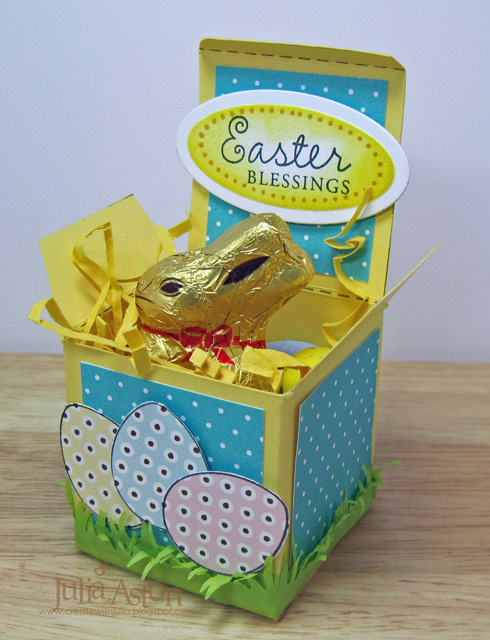 Wishing everyone a most Blessed Easter! 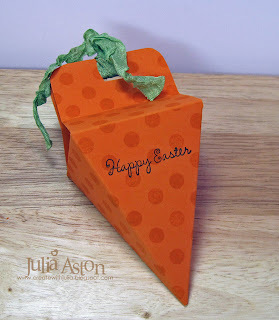 Accessories: fresh cut grass die - MFT, scor tape, Just my Type Cuttlebug embossing panel Provo Craft, Nested eggs Nestabilities, orange zest Saddle stitched ribbon -PTI, foam tape. 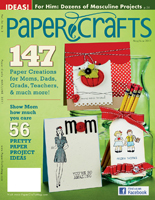 With graduation time coming up for both high schools and colleges - I thought I'd share a project I made that was recently published in the May/June 2011 issue of PaperCrafts Magazine. 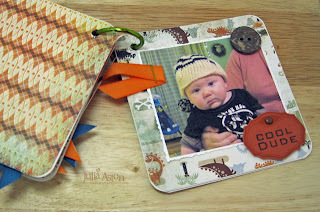 It's an autograph book that I made using coasters and my Zutter Bind it all. 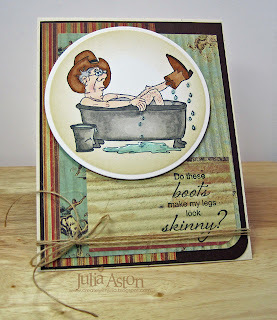 The stamps are from Free Spirit Boy and Free Spirit Sentiments by Waltzingmouse. Perfect quotes for the new graduate don't you think?! 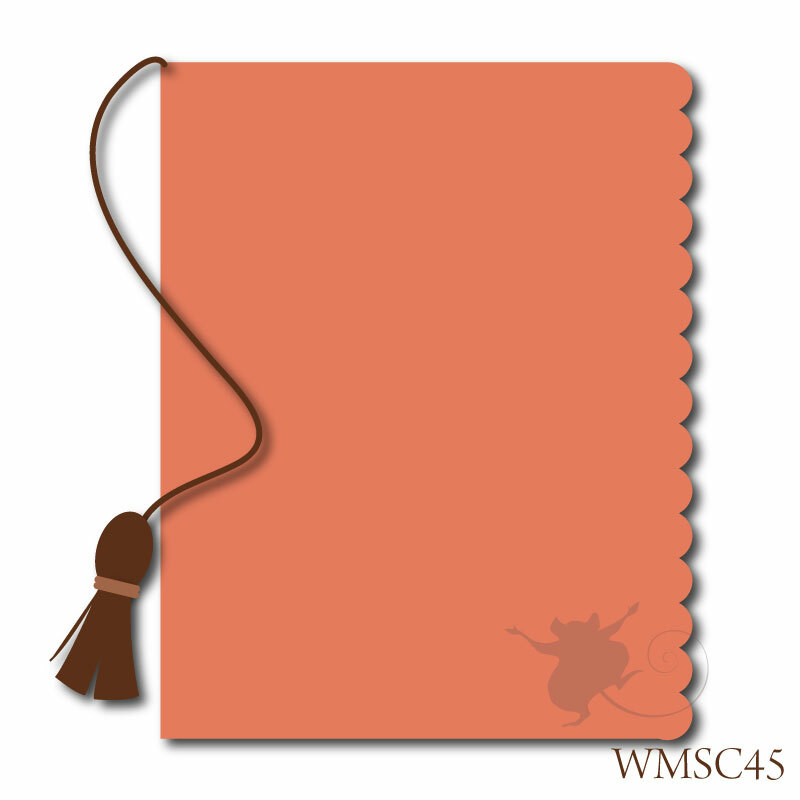 This little book could also be used for photos of the big day and the celebration held after! Have you got a graduation coming up in your family?? Christmas in April - with Snow! 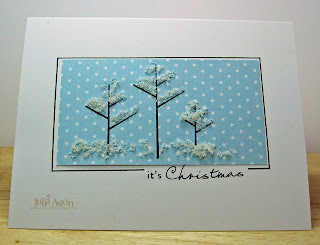 It's time again for the Monthly WMS Christmas Card Challenge over in the Waltzingmouse Forum - this month Lynn's challenge is to use white glitter or flock - Easter Snow if you will!! 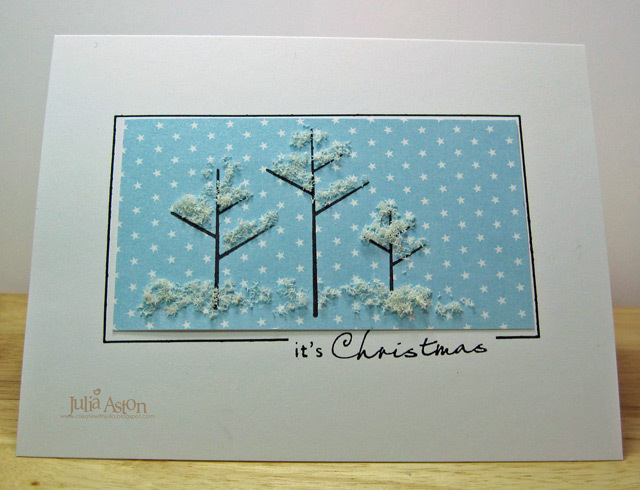 I used ivory Flower Soft on my cards - and I made 3 - each with a different background to see how the snowy trees would look. This is the first one I made - using Enchanted Evening card stock for the background. You can click on any picture to see it larger. For my second try - I used Bitty Star Basics patterned paper in red - thinking this might look rather Christmasy. 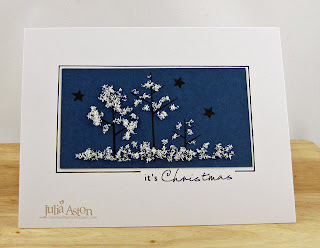 For my third try I used the same Bitty Star Basics paper but in light blue. I used the star paper to be like the night sky - but if I used the Bitty Dot Basics and that might have looked like snowfall?! which it sort of does here since you can't see the fine detail of the stars. 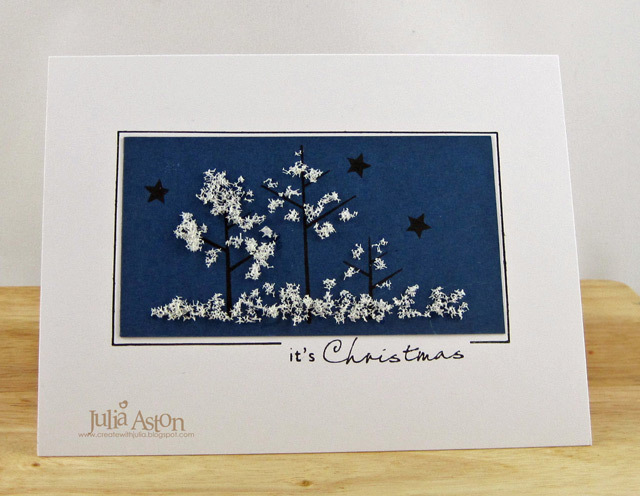 The trees and star (on the first one) are from Teeny Trees and the frame and sentiment are from Frame it. Both of these sets are very versatile and can be used for many different occasions with lots of sentiments in each set - so check them out! I think I like the first one with the dark blue 'sky' background best. Which one do you prefer??? I hope the 'snow' doesn't melt over the summer!!! LOL!!! Now I have 5 more Christmas cards done (I made 3 of the dark blue one while I was at it!) Whoo hoo!!! Come on and join the challenge over in the WMS forum!! Today I'm participating in the Friends of Waltzingmouse Blog Waltz taking place in the Playroom of the WMS forum. You can check out all the details here. 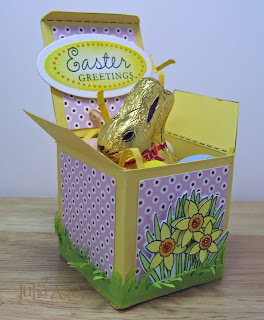 This month's theme is Easter! 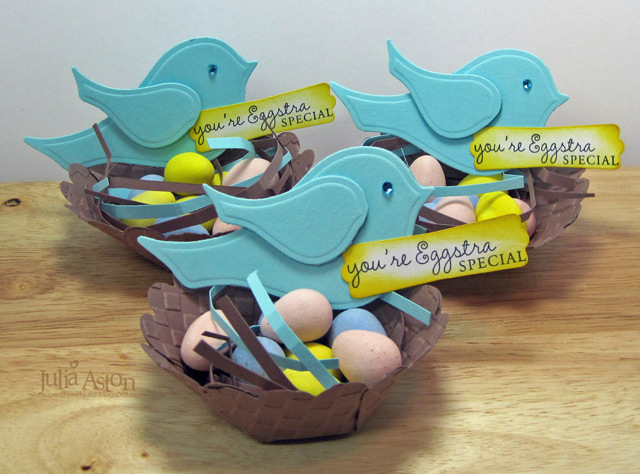 My Easter project is a little paper nest I made with a scalloped circle, filled with little strips of cardstock, yummy Cadbury Eggs topped with a little bird and a message for the receiver! The sentiment is from Spring Baskets. I found instructions and a video tutorial for this sweet little nest on qbees blog here. Basically, you cut a large scalloped circle (mine is 4" diameter), emboss it with an embossing folder (I used my Tim Holtz Checkerboard folder), glue a 1 3/4" circle of cardstock in the center, cut to the circle every 5th scallop ( I cut some every 5th and some every 6th as my circle was a different size than qbees but it didn't seem to matter! ), run some Tombow glue along the edge, overlap the cut edges matching the scallops at the top, and hold 5 seconds till it sticks! To make the nesting material you just cut really thin strips 5" long cardstock, curl them on your finger and put them in the nest! 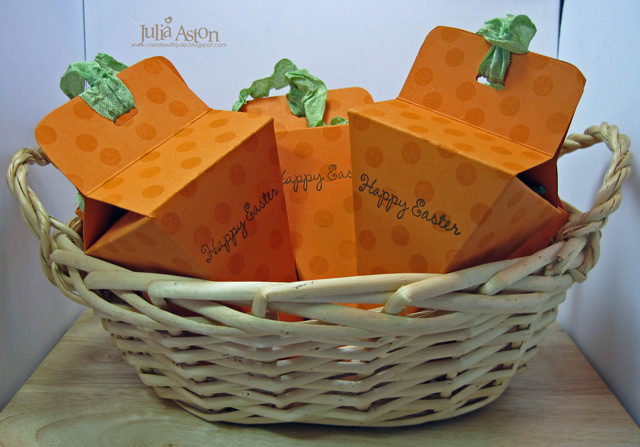 Wouldn't these look sweet on your table for Easter Dinner??!! There's a contest going on in the April Blog Waltz Chat thread in the Playroom over at the WMS Forum - so be sure to check out how you can win! Accessories: jewel - Artesian Pool Bazzill Basics, cropadile, modern label punch + 1 3/4" circle punch - SU, clear flat bottom bags - clearbags.com, Sizzix Tim Holtz Checkerboard Embossing folder, nested birds + scalloped circles - Nestabilities, foam tape, yellow basket shred - Michaels, Scor tape, Cadbury Mini Eggs, wrinkled seam tape - Prairie Bird Boutique Etsy Shop, Tombow glue. Which Came First? The Carrot or the Duck??? Those of you who know me or visit here frequently - know I'm often making seasonal crafts to sell at my church. 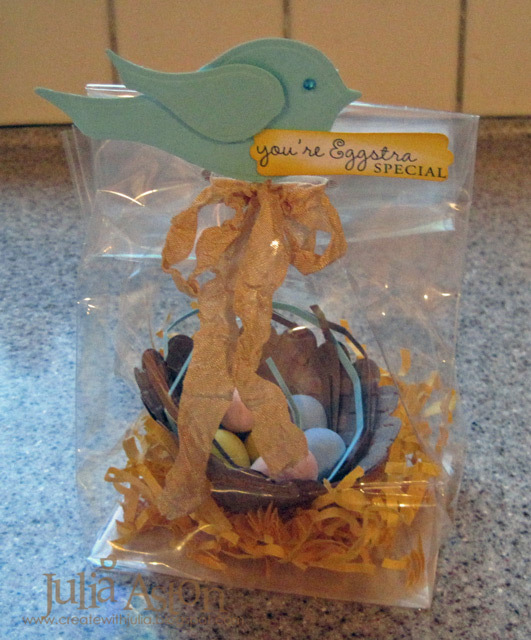 Today I wanted to share a couple of little treats I made for our Easter Sale. First off are these fun stubby carrots - I think I make these every year - they are just so cute they make me laugh just to see them!! Each year I stamp them up a little differently! I fill them with chocolate eggs and a little basket shred. You can find the template for them on Split Coast - here. (ETA I fixed the link - sorry!) 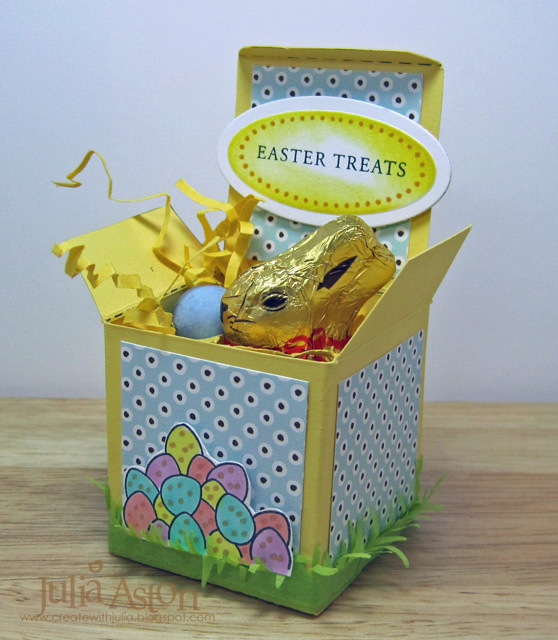 The Easter sentiment is from WMS Spring Baskets and the dots background is from PTI Polka Dot Basics Just click on any pic to see it larger. I always make at least 6 of everything when I make them for a sale - so here are my 6 stubby carrots in a basket! I used wrinkled seam tape for the 'carrot tops'. Then I made some little duck treat holders - that I also found on Split Coast here. I used the duckling pattern. I added punched circle eyes and sponged their bodies and beaks to give them a little dimension. I also stamped Easter sentiments on both wings from WMS Spring Baskets. 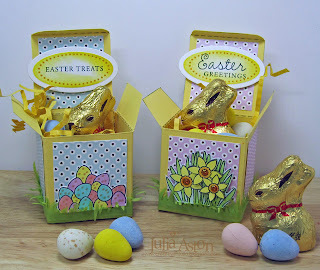 If you'd like to see other Easter Projects I've posted on my blog over the years - click here! Thanks so much for coming by today! And Happy Easter for those who celebrate. Hope you can stop by again tomorrow - I'll have yet another Easter Craft to show you for the Friends of WMS Blog Waltz! Rubbernecker New Release - Skinny Legs! 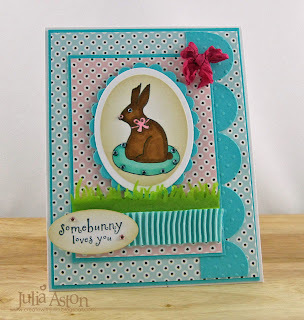 Welcome to another RUBBERNECKER STAMPS release day HOP!! An OLD PEOPLE hop!! Thank you SO much for HOPPING with us today!! 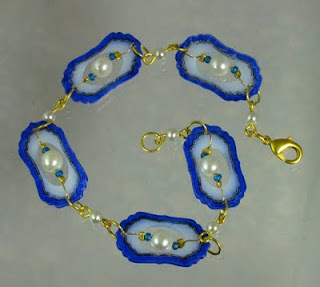 We really enjoy sharing our creations with you!! Besides ALL the GREAT creations? There are PRIZES to be had, as well!! Take a look at what we have for you!! How is that for some PRIZES!! Wonderful, right? WOW, Mr. Rubbernecker sure does LOVE his customers!! 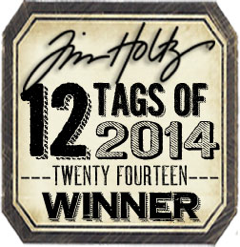 We will announce the winners THURSDAY 4/14 on the Rubbernecker Blog! So, you have until then, to HOP and SIGN-UP!! The official BLOG HOP ROUTE is listed below, in case you should get lost!! ALL of the NEW release stamps, you see today, are available NOW for purchase, at the RUBBERNECKER STORE!! Thanks for joining in our excitement and BEST OF LUCK!! I used Glossy Accents on the water drops and puddle on the floor so it looks wet IRL - I think you can see it better in this close up pic. Click on either picture to make it larger. 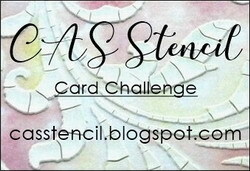 I used the sketch from the Get Sketchy Challenge and the colors from Crazy 4 Challenges for my card today. You'll find my list of supplies below. Now - off you go to see Karen's creation just click on her name below! Accessories - Circle Nestability, foam tape, twine - PTI, Glossy Accents - Inkssentials Ranger, Copics: BG10, BG11, W0, W2, W6, N2, R20, E00, E34, E37, E59, blending tool & nonstick craft mat - Ranger Inkssentials, corner rounder - EK success. Hi dear friends! You may remember, back on April 4th at the end of our Stamp of Approval Parade - Claire invited everyone to get their craftiness on and participate in a Waltzingmouse Competition to CASE any of the the projects seen during the 4 days of the Design Team's Parade. We are happy to announce the winner and show you her entry. Cyndie's winning entry is this wonderful bracelet. Cyndie CASED her project from Anya Schrier’s SOAP Day 3 project. You can find Anya's instructions here. All of the WMS Design Team would like to thank everyone who participated in the competition, all the entries were lovely! You can see them ALL here. Thanks for stopping by today - Don't forget to check out the Rubbernecker blog to see who's sneak peeking today - I'll be participating in the Rubbernecker New Release DT Blog hop tomorrow - hope you'll come by again - there are prizes to be won both days! Rubbernecker Previews - Day 1 - Hoping to Find a Real Stud!! 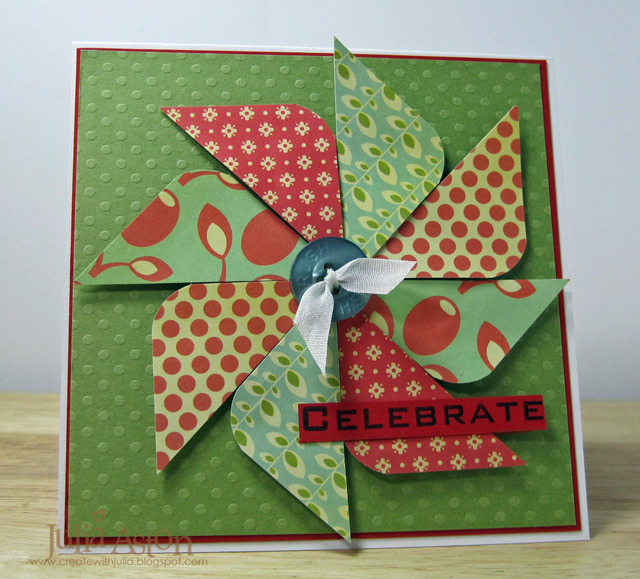 Rubbernecker Stamps is releasing MORE new stamps on Tuesday 4/12/11. To give you a PEEK of what’s to come - we are having TWO days of PREVIEWS!! Welcome to DAY ONE!! Today I'm highlighting happy little Ethel (Ethel Nailing #562-04). Dear Ethel is presently looking for a guy - so this sentiment (Find a Stud #564-12) seemed perfect!! 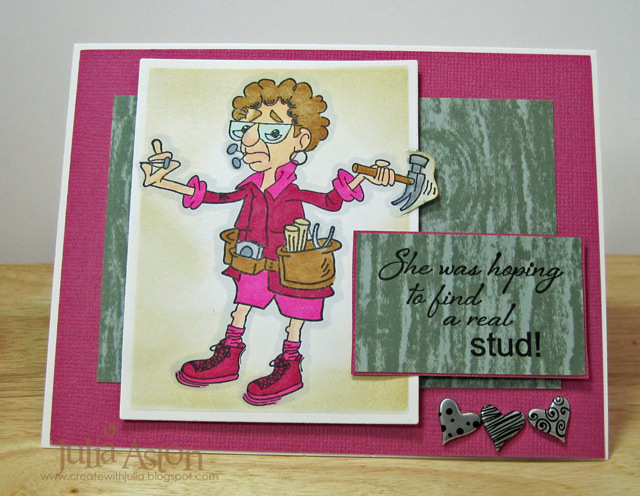 And as you can see - she'd be quite a catch as she is VERY handy around the house!!! I used last Wednesday's sketch from Split Coast for my card. Just click on the pic to see it larger. You will want to visit the Rubbernecker Blog for links to ALL of today’s preview participants!! And you won’t want to miss out on the PRIZE for today!! The Rubbernecker Blog has ALL the details for you!! Thanks for stopping by, enjoy all of the creations, be sure to leave a comment on each DT blog and GOOD LUCK! I won't be participating in the Previews tomorrow - but I WILL be back on Tuesday for the New Release Blog hop - so please stop by then! Oh - and did you happen to see this Moxie Fab World Post yesterday?? My project was one of those featured - whoo hoo!! Accessories: foam Tape, Rectangle Nestabilities, Copics: C1, C6, E00, R20, E31, E35, RV06, RV19, BG10, heart brads - Queen & Co, blending tool & non stick craft mat - Ranger Inkssentials. Inspired to Be a Clown! A fun website, Cox + Cox, from Stephanie today for the Inspiration Challenge over on Split Coast. 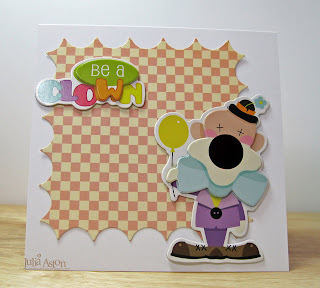 I was inspired by these colorful paperchains and balloons to use some circus themed chipboard pieces I recently purchased to create my fun clown card. I cut my background patterened paper with an inverted scallop square nestability then just attached the fun chipboard pieces! 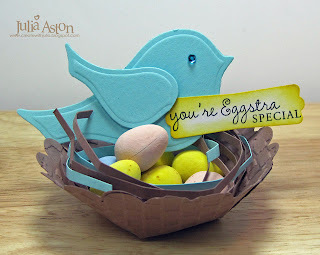 An easy peasy CAS card! This would work great for a birthday card or a 'cheer up' card don't you think? I have had a terrible cold for two weeks now (settled in my chest with a hacking cough!) 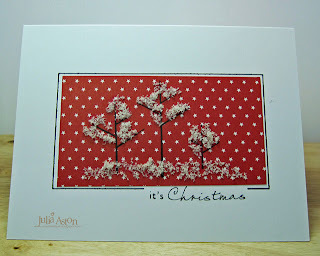 and haven't been able to stamp as much as I wanted to - so I didn't get to the Waltzingmouse Saturday Sketch - but I hope you'll check it out and maybe make a card using it this week! Also wanted to let you know I'll be previewing some fun new stamps from Rubbernecker on Sunday and a DT blog hop on Tuesday for the new release - so hope you'll stop by again for that! It's supposed to be 60 today in MA (whoo hoo!!) so I hope to get out and breathe some fresh air today and maybe clean up the garden a little while I'm at it! 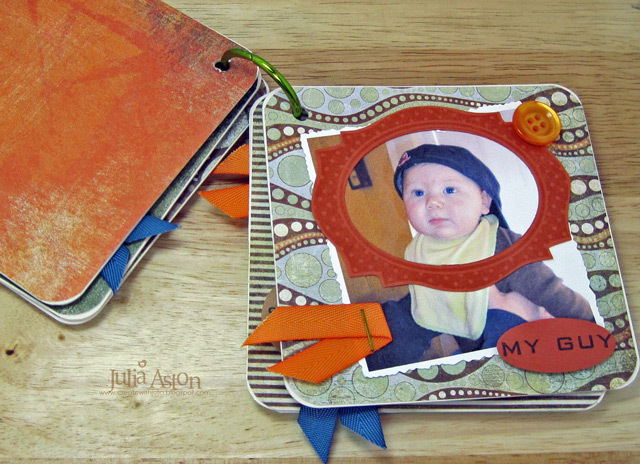 I made my card for this week's Color Challenge on Split Coast. Karen Barber was our color hostess and her choices for us: Poppy Parade, Baja Breeze and Pear Pizzazz. Pretty combo huh?! I made this fun pinwheel using a mix of the challenge colors on these pretty patterned papers. 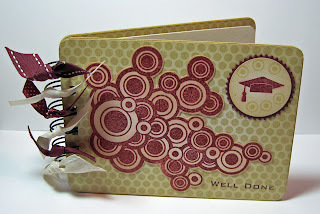 I totally cased this design from my good stampng friend Charlene who cased it from Karen Dunbrook! Don't we just love sharing ideas in the paper crafting world??!! 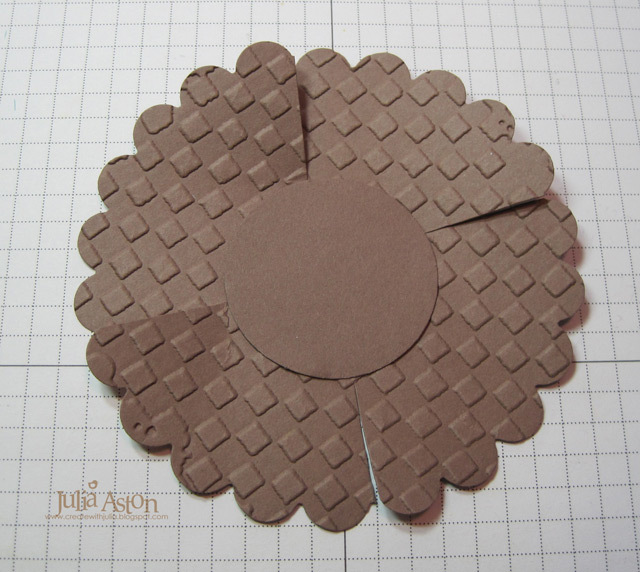 For my pinwheel - I used four 1 1/2" squares - cut them in half corner to corner, rounded the corners then lined them up as shown! My card is 4 1/4" x 4 1/4". I adhered them with foam tape How fun is this? 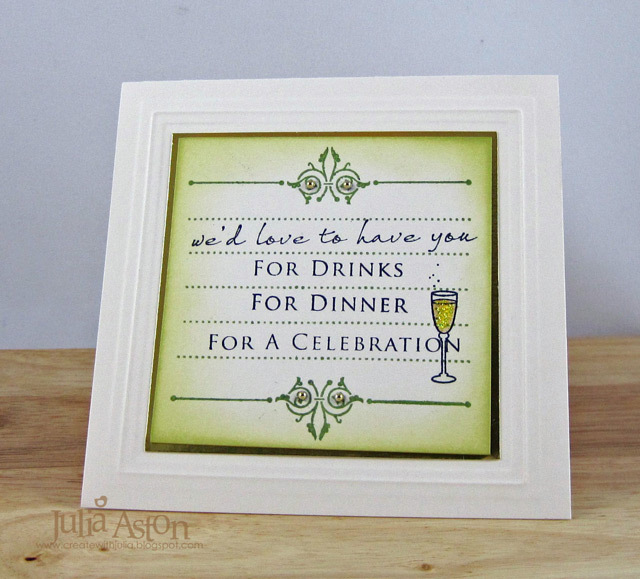 A great party card isn't it - you could celebrate anything with this fun design! Welcome to our 4th and final day of the WMS SOAP! On this last day of our parade - all of the Design Team participants are creating projects using the Spring Blessings stamp set. Just in time to inspire you for any Easter or Springtime projects you may need soon! Today I have made some cute little treat boxes for the Easter dinner table or perhaps to bring when visiting a friend or loved one in a nursing home or even to just give a friend when dropping by to say 'hello'! Just click on any image to see it a bit larger. The dotted oval stamp on the sentiment is from the Fancy Phrases set and all other images are from Spring Baskets. I cut out two of the daffodils and layered them over the image with foam tape. 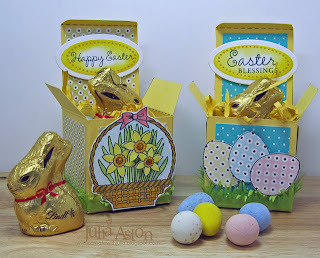 Two of the paper pieced eggs are up on foam tape too - just to give a little dimension. 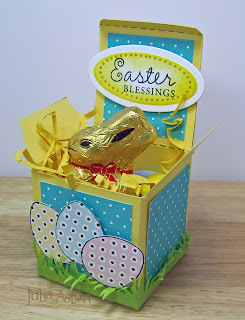 I found the box template at PaperCrafts Magazine under downloads from the 350 Cards and Gifts issue (scroll down till you come to the baby blocks template) I enlarged the template size 125% on my printer to come up with an approximately 2"x2" square box. I cut the grass from green tissue paper (recycled from the inside of a gift bag I received!) using a die from MFT. For the sentiments - I stamped the dotted oval framing with Wild Honey Ranger Ink and the sentiment in black - then cut it with a Petite Oval Nestability, embossed it and sponged with Mustard Seed Ranger ink before removing it from the die. I adhered it to the cover with foam tape. I added some Orange Peel Stickles to the center of my daffodils for a little shimmer! So, there you go - some pretty little Easter Treat boxes for your holiday decorating and treat giving needs! Today we also have an exciting announcement - Claire has chosen 3 new WMS Design Team Members - I am SO excited to welcome Tosha Leyendekker, Kate Whelan and Niki Estes!! whoo hoo! such talent these ladies bring to the table!! - Please welcome them when you visit their blogs linked below with the rest of the design team!! We hope that you have enjoyed, and have been inspired, by our 4 day Stamp of Approval Parade! Now it’s time for you to get your craftiness on as we invite you to participate in a CASE (Copy and Share Everything) competition. Choose a card or project from any of the Design Team projects posted during our parade. CASE that project using Waltzingmouse Stamp images, and link it using the Inlinkz on Claire’s blog. At the end of the competition, one project will be randomly selected to be highlighted with a Parade of its own on several of the Design Team blogs. You have one week to complete your project and link it. The competition will close on April 10th at 8:00 am Claire’s time (3 am Eastern, 2 am Central and Midnight Pacific time). The winner will be announced on Claire’s blog on April 11th. 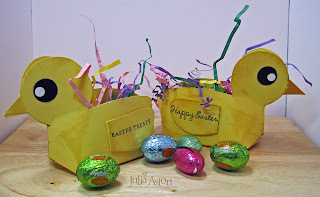 And now - without further ado - here is the blog link list for you to check out all the wonderful ways to use Spring Baskets! Kate Whelan - Welcome New DT Member! 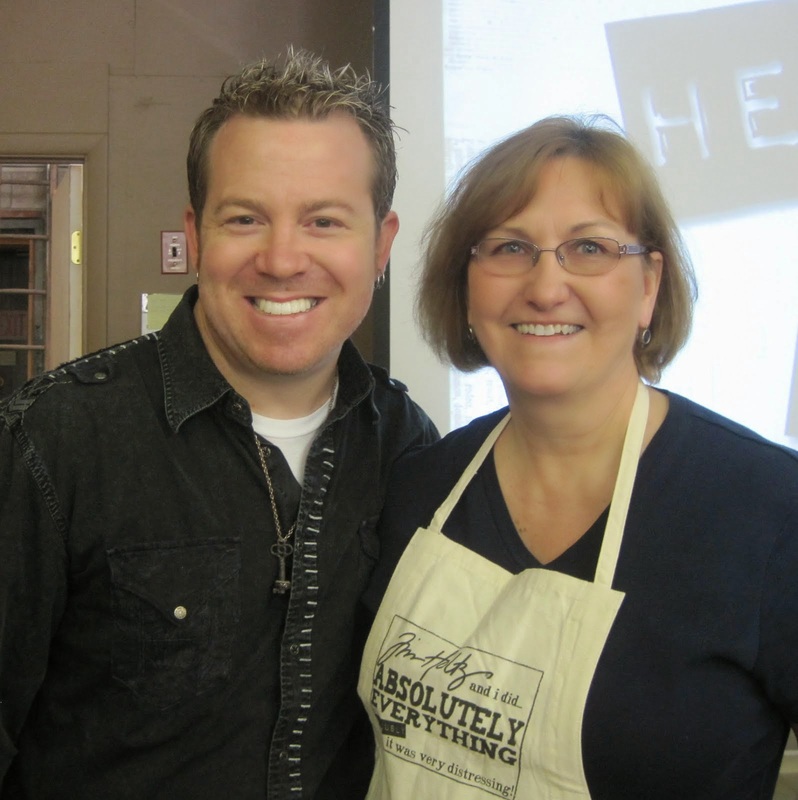 Niki Estes Welcome New DT Member! Tosha Leyendekker Welcome New DT Member! 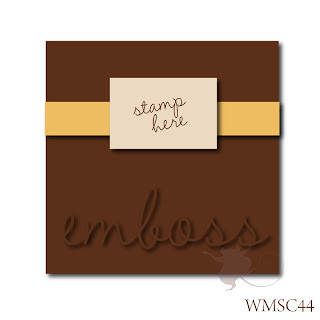 Stamps: Waltzingmouse - Spring Baskets, Fancy Phrases. Paper: Harvest Gold, white, Text Style Happy Spots, Text Style 2009 Bitty Dot Basics - PTI, green tissue paper. Ink: Memento Tuxedo Black, Ranger Distress Wild Honey, Mustard Seed. Accessories: grass die - MFT, petite oval nestability, foam tape, orange peel Stickles, Copics: R32, BG10, YG13, YR24, Y13, Y02, Y38, V12, E34, BG32, Box Template - Papercrafts Magazine Downloads, scortape. WMS SOAP - Stamp of Approval Parade Day #3 - Framed in Sunshine! Welcome to Day #3 of the Waltzingmouse Stamp of Approval Parade (SOAP) Are you loving the review of last month's release?? Have you gotten some new ideas for using these great sets? 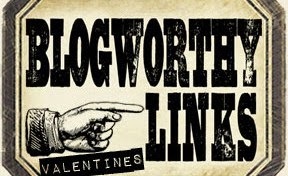 Today I'm highlighting Very Vintage Labels 18 along with sentiments from some older sets. Many of you know that I am the proud grand-aunt of 6 month old Landon - he's been featured here on my blog several times since he arrived in Sept! We have had quite a snowy winter this year in Massachusetts and so Landon has acquired many winter hats! And of course we have many pics of Landon in his many winter hats! 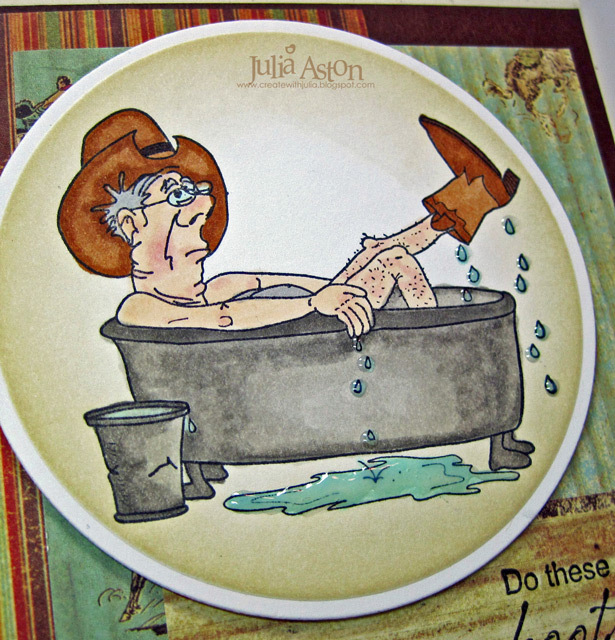 Hence - the creation of this little coaster photo book - of Landon in his hats! Just click on each pic for a closer view! 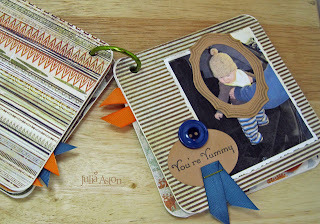 I used half of the text label stamp on this page along with a sentiment from Half Pint Heroes. The book is made from 4"x4" light weight coasters, covered in Basic Grey Archaic papers. 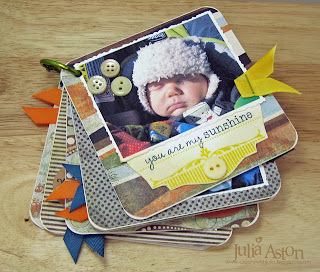 Here's a little tag label from the set with a sentiment from Free Spirit Sentiments. I still don't have the Labels 18 Nestability dies yet - so I just hand cut the outside edge on this frame and cut the inside out with my exacto knife! This cute little hat was my son's when he was a baby - and now we're 'recycling' it with Landon - and can you see those cute tiny mittens on him? His Aunt Chrstie knit them for him!! She's expecting her first baby, a boy, in June so this hat may get recycled yet again! The 'cute' sentiment is from Half Pint Heroes. Another frame that I hand cut and used an oval Nestability to cut out the inside - then I used that oval for my sentiment! which is from Oven Fresh Gingerbread Joy. I just love his yummy striped pants in this pic! 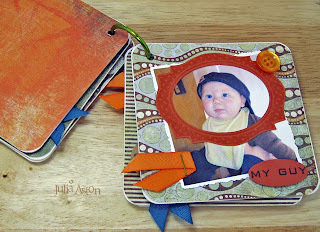 And my last page uses the label frame again with another sentiment from Free Spirit - Sentiments. FYI - I printed my photos on white card stock and cut around the edges with deckeled edge scissors from SU to look the way photos used to come when you had them developed (are you old enough to remember those??!) I stapled the ribbons on before adhering the patterned paper on the backs so the back of the staple wouldn't show! And, of course, adult supervision is needed if a little tyke is looking at this book as they could rip off the buttons and put them in their mouths! I punched the holes in the corners with my Cropadile and the book ring is from Staples. I hope you enjoyed my little photo book today and that it might inspire you to create one yourself??!! 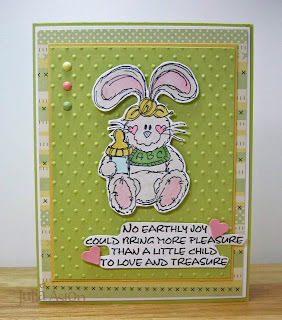 Please click on the links below for much more inspiration from the rest of the DT using the WMS March release stamp sets!! Hope to see you back here tomorrow - for our 4th and final Parade day when we will be featuring the Spring Baskets set from last year and also announcing a fun little competition!! 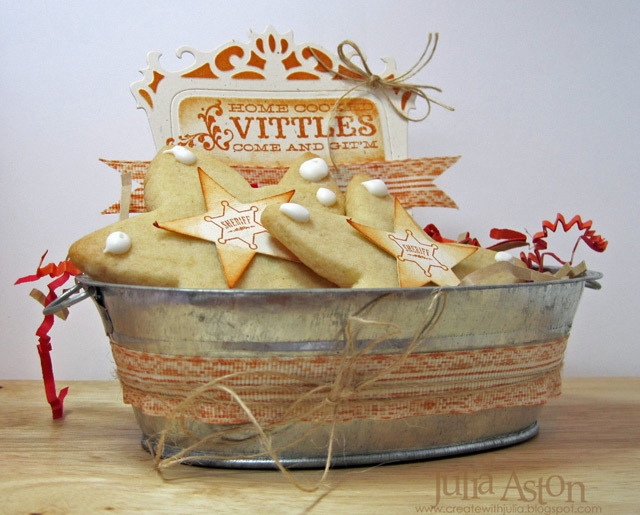 Stamps: Waltzingmouse - Very Vintage Labels 18, Oven Fresh Gingerbread Joy, Free Spirit Sentiments, Half Pint Heroes. Paper: White - Couture Cardstock, Really Rust, Creamy Caramel - SU, Ocean Tides, Blueberry Sky - PTI, DP - Basic Grey Archaic Paper Pad. Ink: Memento Tuxedo Black, Ranger Distress Bundled Sage, Rusty Hinge, Mustard Seed, Antique Linen, Faded Jeans, Pumice Stone. Accessories: Small oval punch - SU, brads - Imaginesce, 4x4 coasters - Eclectic Paperie, corner rounder -EK Success, Crop a dile, exacto knife, twill ribbon - PTI, glue dots. Today - I have chosen to highlight Back in the Saddle. I found this great little washtub container at CVS for $1.99 and thought it was perfect for a Western theme treat holder. 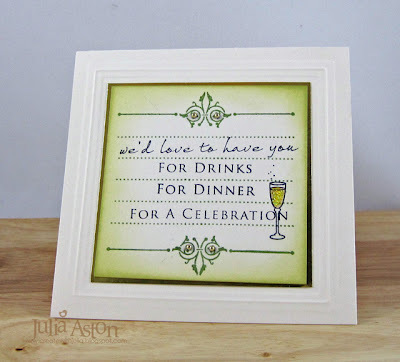 I stamped the sentiment and die cut it with my Classic Frame from Spellbinders. I sponged the frame and around the sentiment before taking it out of the die. Since the die cuts the center part out - I just taped it back together from the back. I trimmed off the bottom portion and adhered it inside the little tub. 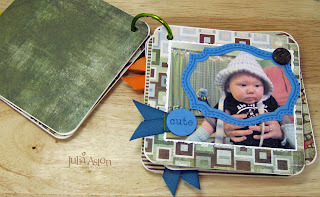 I stamped the blanket background stamp onto grosgrain ribbon. I adhered some of it across the frame and some around the tub. I wrapped twine around the tub three times and tied a bow. I baked these star sugar cookies and adhered the punched stamped stars to the centers with frosting and put dabs of frosting on each star point. 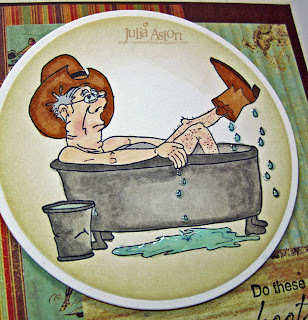 A great little favor for a Western theme party don't you think?? Now please check out the inspiring creations from the other DT who are 'marching' in the parade today! Just click on the links below! Hope you can stop by tomorrow for Parade Day #3! Stamps: Waltzingmouse - Back in the Saddle. 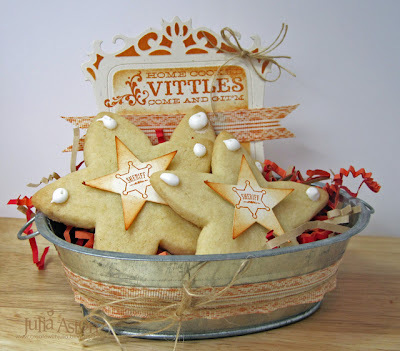 Accessories: star punch - Fiskars, twine + vintage cream grosgrain ribbon - PTI, sugar cookies, Betty Crocker Cookie Icing, scor tape, Classic frame - Spellbinders.